Louis de Rochemont had a bone to pick in 1938. In the 1930s, American attitudes toward Nazi Germany and Adolph Hitler were mixed. Even as Hitler ratcheted up his attacks on German Jews and increased his rhetoric about Germany reclaiming countries lost in World War I, there was some admiration for his restoration of the German economy. Streets were clean, men had jobs and the country was attractive. The 1936 Olympic games had provided a showcase for German achievement, as well as its volatile leader, who some still believed was a laughable buffoon. But Louis de Rochemont saw, instead, the harsh fascist policies Hitler employed to make his vision for Germany come true. True, men had jobs, but they had no labor unions to demand good pay or protect their rights. German farms were booming, but it was because families were forced to support them. German children were well-cared for, but only while being indoctrinated in fascist principles. By 1938, many in America still believed Hitler could be moderated by others in Germany, and that the worst of his threats against Jews and other minorities were just rhetoric. Within Germany itself some didn't believe Hitler was serious in his threats. Some Jewish German bankers even gave money to the Nazi party, believing it would have a moderating influence on Hitler. Back in America some journalists sounded alarms about Hitler's Germany, but their voices were mixed in with others who were less critical and repeated the American government's more moderate line. Those sounding the alarm simply didn't have a loud enough voice. But Louis de Rochemont did. He had a much louder megaphone than most, and he decided to direct it at Hitler's Germany. Louis de Rochemont's megaphone was: The March of Time. It was a documentary-style film series that each month showed at movie theaters around the country. News reels were not new, but The March of Time advanced the art of news reels. It ran 20 to 30 minutes, much longer than most, and it dramatized its stories using actual footage, as well as actors and staged scenes, to bring the story lines to life. And it was not afraid to be political. de Rochemont had taken over as producer of The March of Time in 1935, in partnership with Time Magazine. He tackled topics such as the harsh working conditions of American blacks working in the cotton fields of the South and environmental issues, such as the farming practices that caused the dust bowl and controversy over developing Florida's wild lands. But it was fascism that drew most of de Rochemont's fire. In January, 1938 - almost a year before the Nazi's launched the Kristallnacht rioting and violence that openly targeted Jewish families and businesses - de Rochemont put his film, Inside Nazi Germany, into American theaters. You can watch it here. Today, with the benefit of hindsight, the film seems tame as it looks at how Hitler's fascist government impinged on the liberties of the typical German household and how antisemitism was spreading in the country as it built up a fierce war machine. de Rochemont had in his sights not just changing opinion about Hitler, who was not popular in America, but also snuffing out support for Nazi politics in America. The German American Bund - a U.S.-based organization of German-Americans who supported Nazi politics - was slowly growing across the country. Among the group's organizing tools were a series of summer camps for Germans to visit. As he did in other films, de Rochemont found material for Inside Nazi Germany in his own back yard: Southbury, Connecticut. While the American Nazis had been able to build camps throughout other parts of the country, Connecticut reacted in horror at news that the Nazis had bought land in Southbury for a campground. Two of the campground builders were arrested for working on a Sunday in violation of the state's blue laws. The town organized to block the camp by changing its zoning laws, which drove the American Nazis to sell the land and move on. The message to moviegoers was clear: they should follow the lead of flinty New Englanders and not give Nazi ideals a home. de Rochemont himself could be described as a flinty New Englander. He was born in Massachusetts in 1899 and his family moved to Newington, N.H. when he was a boy. It would be his lifelong home. He developed a love of theater as a youngster, and cut his teeth working for the newsreels, covering news. By the time he was heading The March of Time, de Rochemont had polished his craft. He had a knack for spotting international hot-spots and highlighting them for viewers at just the right moment. And he knew how to dramatize news stories for easy consumption. Inside Nazi Germany has been recognized as very influential in shaping American attitudes toward Germany and Nazism. 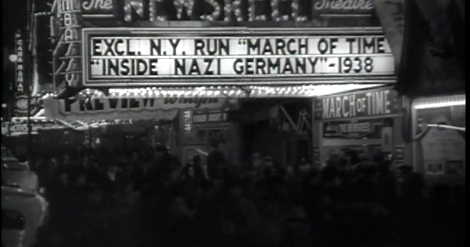 de Rochemont and The March of Time would inspire characters in Orson Welle's film, Citizen Kane, which featured the work of journalists working for the fictional newsreel News on the March. After the war, de Rochemont left The March of Time in the hands of his brother, Richard. Richard would win an Academy Award for a March of Time episode that focused on the post-World War II struggles of Italians. Louis, meanwhile, would go on to producing feature films. Two films he produced were set in his home state of New Hampshire. The Whistle at Eaton Falls (1951) was set in a New Hampshire mill town and highlighted labor-management strife. It marked the film debut of Ernest Borgnine. Lost Boundaries (1949) told the story of a New Hampshire couple who were black but passed as white to avoid racism, and the complications that brought to their lives. Perhaps his most unusual work was de Rochemont's production of an animated version of George Orwell's Animal Farm. He developed the cartoon in partnership with the CIA, which lead his critics to categories de Rochemont as an anti-communist propagandist. You can watch it here. Critics of de Rochemont's work argue that in his docu-drama style he was too free with his use of actors and fabricating scenes to tell his stories. And his reputation suffered because of his staunch anti-communism and the ugly aspects of the communist purges in the film industry in the 1950s.